The video slot Pink Elephants from Thunderkick is a 6-reel slot with 4096 (!) paylines. It has a really nice artwork with a cartoon illustration style – a small touch of The Lion King, a small chunk of Madagascar and few pieces of something else – all in all, truly a really cool mixture, if you ask anyone here at Dreamz Casino anyway! It have a few different features with a really nice bonus game that can give you that big win we all want. As many other slot machines it have regular WILD symbols that may appear on all reels. Always helpful to connect paylines, especially when the slot have 4096 possible paylines. A few wilds can build up to a huge win if they connect in a good way. May appear on all reels and always before the spin, before the first reel is determined. It gives you a bigger chance to activate the bonus game as you are granted 1 scatter symbol “for free”. So if you’re like me and love bonus games – keep your eyes open for this one! Pink Elephants has a really cool bonus game, let’s take a closer look at it! As always, the bonus is activated by scatter symbols. The amount of free spins in the bonus game can vary between 7-19, it depends on how many scatter symbols you get for the specific spin. You also have a chance to claim more free spins during the bonus game by collecting more scatter symbols. 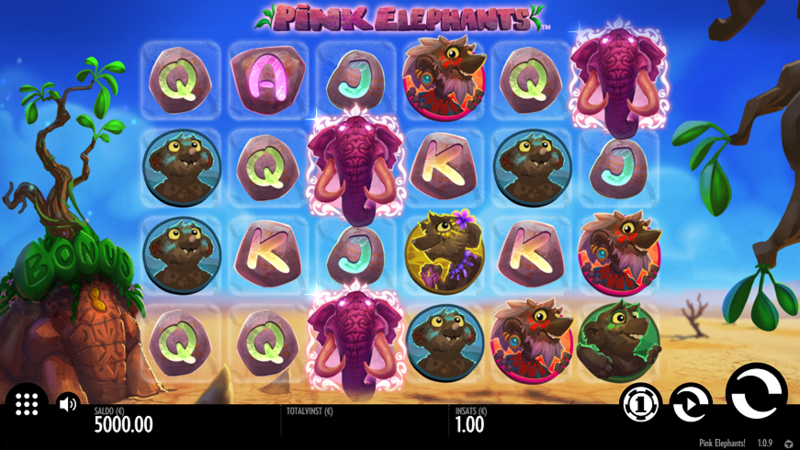 During the bonus games your mission is to collect as many pink elephants as possible so you turn regular symbols into WILD symbols and boost your chance of winning. There are 3 different symbols you can convert to wilds. You need 10 pink elephants to convert each symbols and in addition you get 1 one free spin for each symbol you manage to convert. If you manage to convert all 3 different symbols (collect 30 elephants) in to wilds you have a really, really good chance to claim some huge winnings! This video slot have the to things most player value most – amazing illustrations and a fun bonus game that gives you a chance to win BIG! It have a RTP over 96%, which is quite high as well! It doesn’t have any jackpot, so if you’re looking for the possibility of a multi-million winnings you’ll have to swing by the jackpot section instead! Dreamz Casino’s final word – Give it a try! Play for free or not, just give it a try and experience a really nice video slot!